Happy Friday everyone! The weather is finally beginning to become consistent with the beautiful temperatures. Plus Memorial day is right around the corner so I am sure many of you are ready to celebrate this weekend. I am still doing little “Spring cleaning” with these posts so here is another one. Also, since this look consists of Memorial day colors, I guess it’s safe to say, we can make this a little edition. At this past special moment, I had attended a Rose event at the 230 Fifth Rooftop and Penthouse Lounge. 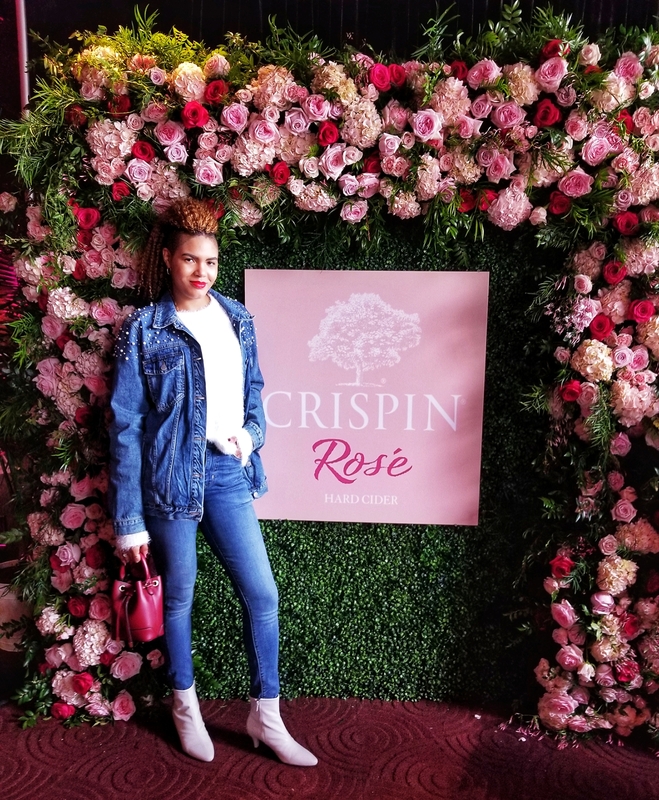 An event held by Crispin Cider, promoting one of their flavors called the Crispin Rose, which was delicious. We also had brunch, music, instagrammable photo ops with amazing decor. I decided to go for a monochrome denim look for this special day. It was a little chilly which is why this fluffy white textured sweater was perfect. It was light and breezy but thick enough to keep you a bit warm if needed. I layered that with my embellished pearl denim jacket which I have been hunting, paired with my monogrammed skinny jeans. I popped on some white booties for contrast and it also went perfectly with the pearls. You should know by now, that I am all about those details. For the bag, I added a nice mini red bucket bag of pop with matching red lips to the attire. How cute is this? Who doesn’t love a mini bucket? Only my mother. To top it off, threw on some shades for that cool factor. And there you have it! Another one shared and I find it coincidentally funny, that this look had the perfect colors for this holiday weekend. I hope you all have a safe, happy and memorable Memorial day weekend! See you next time and Happy Styling! Love the colors…i think it tied perfectly into the weekend. Might have to try their cider..